One of the best-known and most controversial tribunal trials since the beginning of their existence was the criminal trial number 2T 399/1953 of the former People\'s Court Trenčín against Valéria Čevela born Stiglitz and Jozef Čevela in the year 1953. (For 1/12 house and garage on land Štefánikova No 9 in Trencin, the joint co-tenants and 2290 Euro per year. Properties are rented by the expert Ing. Juraj Šinka company Client & Partner Business Development s.r.o., Toner recycling service s.r.o. and comp. Gaben s.r.o. (In the city of Trenčín in this house in the General M.R. Stefanik street No 9, before No 33 (except for long service in the field), was the beginning of January 1944 First lieutenant Aladár II. Ondrejkovič police logged and the entire family to protect his wife from deportation and confiscation of property on the basis of racial grounds. Protect their repeated contacts with your friends (Dr. Viktor Pavella, JUDr. Valentini, Dr. Anton Neumann, Dr. Karol Reindl (10/05/1953 indirectly accused him Commissioner of the Interior Josef Lietavec in the notice of adverse activity of the former President Corps of Commissioners in the process faced by Dr. Gustav Husák), Dr. Martin Mičura, Dr. Aladár Ondrejkovič I, Stefan Turba, colonel Alojz Androvič, Stefan Balazsovics, brother Tibor Ondrejkovič etc.) 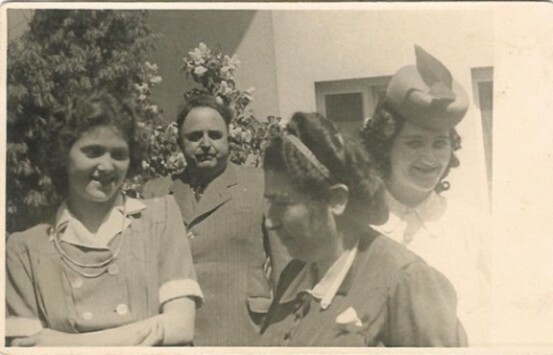 and relatives in Bratislava during the war years. Protected is also registering for the trade license (spirits and wine) for his proposal to name the wife of the family. Despite the mobilization of serving as an active officer in the other cities of stationary from the criminal trial of Jozef and Valéria Čevela in 1953 it\'s very detrimental. Needed with his wife and children to help him, her family returned. Family wife of the assistance did not return, he refrained, as several of its members has meanwhile gained high positions in the Communist Party, and he already had what they provide). On 24.XI.1952, the District National Committee in Trenčín secured all the property of Jozef Čevela and Valérie Čevela born Stiglitz (proof: criminal file of the former People\'s Court Trenčín No 2 T 399/1953). In the year 1953 was married Čevela was publicly exposed in Hotel Tatra Trenčín in with things found in search villa at Trenčín Štefanikova No 9 (33). Students of all schools and staff and the organization of the factories had to be obliged to participate in this exhibition. Induced psychosis People\'s Court crowd was very negative. Spectators vituperate defendants publicly and pluto for them if they knew, as well as family, Mrs. Čevela originating from Trenčín. Did that Mr. Jozef Čevela not in spirits, knowing that these spirits and raw materials for the manufacture and installation of their produktion not his property. 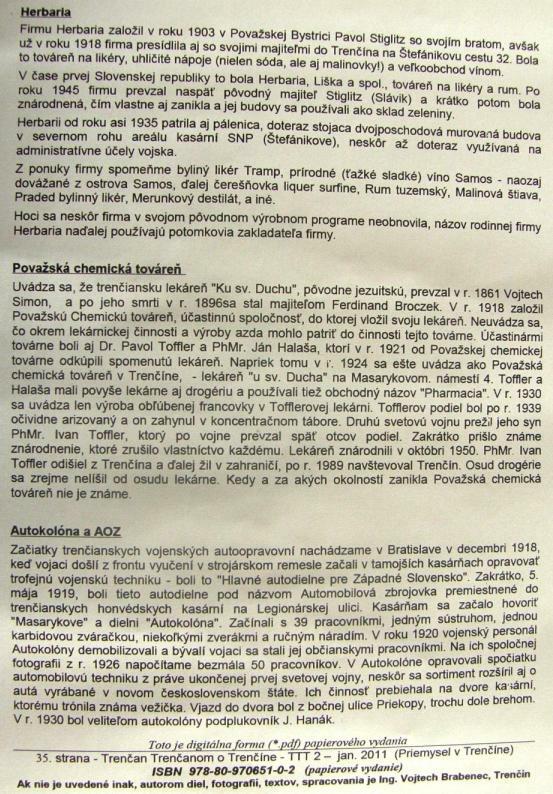 Proof: List of confiscated spirits and equipment for their production listed in the Judgment of the former People\'s Court in Trenčín, file no. 2T 399/1953 (the Minister of Defense, Alexej Čepička and the Headquarters of the 2nd Military District in Trenčín, gave the initiative). He known that mr. Čevela have indigent sister-in-law Júlia (Juli) Ličko born Stiglitz, who never had no assets (take her dowry siblings and brother-in-law), bad comes with sister Valéria Čevela born Stiglitz of wealth and lives of their parents weighted family Stiglitz, producing spirits, liqueurs, fruit juices and bukus. Julia\'s brother, Pavol Stiglitz, was 6 years younger. His marriage to Malvína Kováčová, concluded on 27 November 1932 in Trnava, brought to him and to the whole family unhappiness and unstable problems. Even the subsequent divorce could not correct them. Brother Pavol Stiglitz later, with the spirits in its 50% share in the decision against the parents (firm Herbária Stiglitz) on leased property of family. Profit firms Herbária is divided in the ratio of 50% Bartolomej Stiglitz and his wife Charlotte Stiglitz (Sarlota, Sali) born Büchler and 50% of their son Pavol. In the case dead one of his parents passed amount to a surviving parent. I.e. son Pavol S. the death of his mother and the subsequent inheritance (bad in his declaration of dead day 13.01.1948) donot dispo with 50% profit firm Herbária and can not alone decide how the manager. (Too today is on the family land in the Stiglitz Ground book Trenčín land enrolled in at least 2000 ha of land). After crossing the front in spring 1945 Paulina Dubček lived with son Alexander in Trenčín. She was publicly active in a local women\'s association, a member of the jury of the District Court of the People\'s Court in Trenčín, and a member of the Communist Party of member of Trenčín Town Office from 04.11.1946 and of a commemorative (as an alternate) since 21.01.1948. Together with his husband, Stefan Dubček (until the arrest in 1942, member of the 3rd Illegal Office of the Social Security Office), she worked as a member of the Office of the ÚR SZPB. Both and his son Alexander knew well the famous Evangelic family Ličko of Trenčín, Mrs. Paulina also met the Ondrejkovič family from Bánovce nad Bebravou. The Jewish families of Stiglitz, Büchler, Weiner-Kráľ and Blüh have also been recognized. After 1960, in the building of the Office of the ÚR SZPB in Bratislava on Štúrova Street, Ms. Alžbeta Ondrejkovičová born Ličková was asked several times. 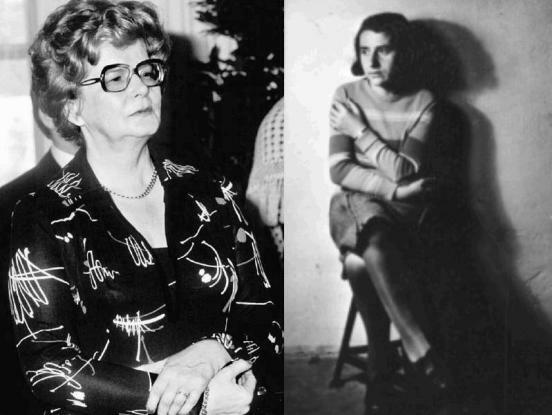 Ličko to her family in Trenčín, with her mother Júlia Ličková born Stiglitz having at least one tenement and other property in Trenčín, "she had to have his parents". They also repeated themselves as members of the ÚR SZPB at its meeting. When Alžbeta said "did not do anything" they argued that they would know his family with his son Alexander (Alexander Dubček was in Trenčín in the private home of her sister Alice Ličková and her husband ing. Ervín Kellermann, former chairman of the ZO SZPB Trenčín) and " possible". They also repeated it at the Office of the ÚR SZPB in Bratislava. The court violated all what could be violating. Too violated laws adopted after year 1948. Too stranger mouse in the right knows that the dead can not take nothing. (Oi Slovak civil law since 1950 was reunited with the law in force in Bohemia and Moravia). Under the firm register of Trenčín and Považská Bystrica Trenčín of the court gave too thoose channels. Firm in the register was still registred in the name of firms since 1936 Bartolomej (Bartalam) Stiglitz late father, and partly to the late mother Charlotte (Sarlota, Sali) Stiglitz born Büchler. These companies have been registered to do business oi in the field of spirits, bukus and raw materials for their production. In the course of judicial proceedings No 2 T 399/1953 (motion gave the Minister of Defense Alexei Čepička) former People\'s Court in Trenčín came to light several breaches of law with judges persons of Trencin in the past and was to continue working in the judiciary. 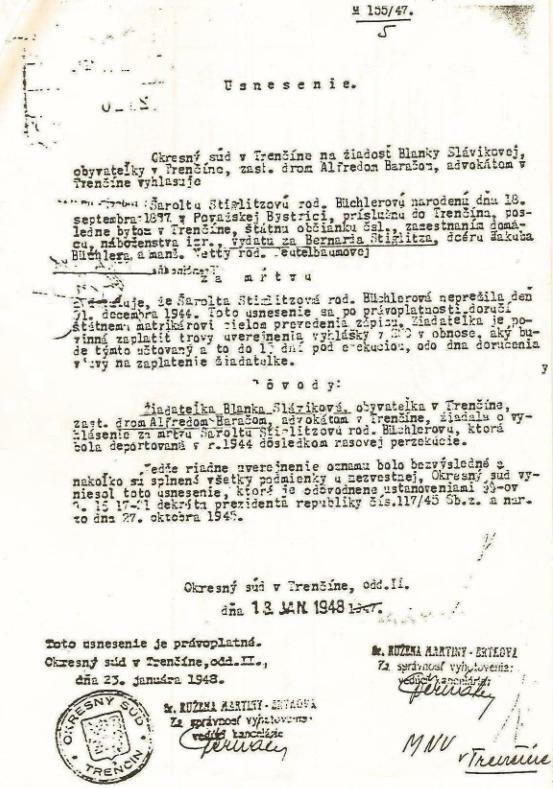 Circumvent the Court Order of the District Court Trenčín No M 155/1947 day of 13.january 1948. Lawsuit severely affected not only the accused, but the family too, which is in the eyes of the judiciary outrage that was conected with the family and not in the past, the liquidation of the succession. Has no assets, but had four minor children and knew that possession of valuables Čevela missing husbands and are not in the list of seized things. 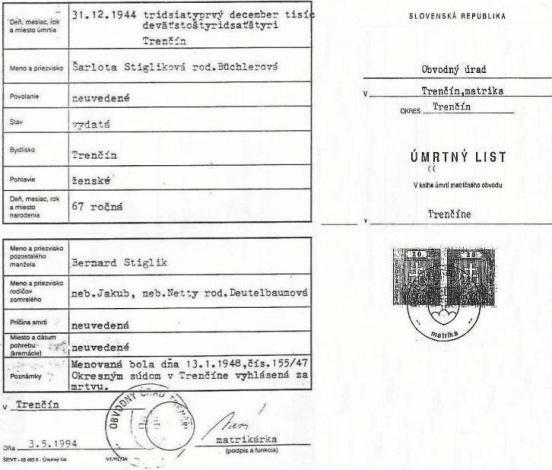 Proof: List of confiscated matters annexed to the Judgment of the former District Court of Trenčín of the figurative mark 2 T 399/1953. It was therefore in the eyes of the judiciary and governments must act against them long the hardest possible way that they can not and will never speak mainly forbid the. The consequences of a particular attitude to the current judicial power of the long persecution of the author remain in the family today. Special courts decision went far. In marked property of spouses Čevela the property acquired together although evidence in the court file showed that it is a koakvisition ie Community property of spouses. Some civil servants are not reluctant today to repeat invasions against the nearest author\'s family. For example, former state security officers, now officials in the Slovak National Archives (arguing against the author of the police criminal judge, Dr. Aladár I. Ondrejkovič) at Drotarska 42 in Bratislava. Certainly, they had a reason for the way they worked. Eviction from the apartment (already former officer) Aladár II. Ondrejkovič of four young children on the street in Christmas Eve 24.12.1953 in connection with the criminal process No 2 T 399/1953 of the former People\'s Court in Trencin against Josef Čevela and his wife Valerie Čevela genus. Stiglitz (family, his wife Alžbeta) in respect of Shares "D" and "B" (initiated by Defense Minister Alexei Čepička). Following that process was Captain Aladár II. Ondrejkovič released in Action "D" of the army, and when the eviction of the apartment with his family to his father that divided the apartment (in Action "B" - Flats) and the whole family moved into one room of deaths in teacher administrator Stefan II. Ondrejkovič. Action "B" - Flats governed commission chaired by Jozef Lietavec. The purposeful decision of the courts went far. In the judgment No 2T 399/1953 marked the property of the Čevela spouses as jointly acquired property, even though the evidence in the court file indicated that it was co-ownership, that is to say the property of the spouses and the assets inherited, or, at least, part of it was their property, but only in their possession.. Builder Jozef Čevela was sentenced to 13 year imprisonment and oi forfeiture of all property in the state. Valeria with severe cancer disease was sentenced to the confiscation of all his movable and immovable property, including property inherited. Was it too assets confiscated its actually talked about what did not belong in those years, all the public in Slovakia. The late fifties as a small child author exhibited in the pillory Ján Dianovský prominent, politically exposed Director two skools in Vazovova street of Bratislava. Comrade skool director publicly Dianovský all scream for all to his command in the gym collected by school pupils, that the property belonged too in Trenčín Júlia Ličko Stiglitz daughter and her mother of the author, father of the author, even too the author as a child are the enemies of the working class of series big bourgeoisie, who belong to labor camps. (but not reminded why his origins after noble family Sandor de, bad to forget?). Scream as a prosecutor Jozef Urválek in the process with Milada Horaková too when he knows that the old author\'s mother was poor, good, sezitive and against its people punching completely vulnerable woman. The author believes that with this performance must to have too personal benefit. Not all teachers at the school Vazovova street mali such views. Nevertheless, it all forces opposite his superior Ján Dianovský tried to protect Dear sir Ján Šlahor, his class teacher. Quietly he too tried to help his schoolmistress mathematics, history and geography. Favorite teacher was too in the Slovak language. Wirh the same observations and comments on his person and the family met the author in his work from his superior oi member folk militias. By the later third parties, non-learned that the card with the profile of his principal\'s fathers was not famous for his work in Hlinka Guard in 1945. Senior author, also had to know that reality is different because his mother was of Trenčín familiar with the case. The author on the causes of deficiencies in the current judicial system in Slovakia, and how to address them. Author is not a qualified lawyer, but to have generations of lawyers in family, senior government officials and district notaries who manage century state and the model was its moral properties. a. card and personality. Most of the judges remained in office too after the year 1945. Although it is not possible direct to serious mismanagement in the years 1939-45, but they are often related to activity of their relatives, who both held. This was a serious defect for the exercise of judicial profession, if not taken into account the likely hostile to public views. Unfortunately deliberate inconsistencies and the resulting errors are repeated after the year 1989. In addition to these reasons the court a person easily blackmail. Their resolutions and judgments can not be explained any other way. The author believes that sufficient evidence is the resolution as the District Court Trenčín No M 155/47 of 13.january 1948, the judge decided that Dr. Ružena Martiny-Brtková, although aware of the circumstances referred to in its resolutions that are not true and the rights of third parties. According to the author just so flawed resolution help interested parties to avoid law enforcement they have committed for the purpose of benefit. (Brtko from Trenčín was sentenced to national courts for involvement in the deportations of Slovak citizens in August 1944. Father of the author with his pregnant wife met him at the beginning of 1945 in Bratislava. Brtko asked him to mockery - you slowakian officers you have so little. Father he was harshly answered - You mean you, we deportated grand mother of me wife. Brtko if already answered coward - his rich family had hidden in his flat his pure daugheter Julia, who was suspected that it was hidden). Newspaper "Gardista" Year II, Number 57. Temporary administrators of Jewish enterprises. Bratislava, November 16, 1940. In recent days, the Central Economic Office (ÚHÚ) has appointed the first temporary administrators to become Jewish companies. We publish the names of the Jewish enterprises and the Aryan Temporary Administrators: ......... into the commodities and carpets of J. Kurlender in Trenčín - Urbánek Václav ..... Brtko Eugen, to the D. Kohn meat shop in Holíč. ... Slezák Ján, to a shop with the starch goods of the company J. Braun and a companion in Bratislava ..... Source: newspaper "Gardista" dated 17 November 1940 page no.4. Trenčín (F.J.). - We still have people in our offices who do not deserve it at all. So, for example, the city treasurer Brtko, who as a guardsman expelled the Bohemian brothers and stormed against the USSR and CA ... Source: "Pravda" newspaper dated August 10, 1945, page 6. Currently, no valid long-term rental tenants and joint shares 1/12 the house, garage, warehouse and land Hodžova 1 and Rázusová 4 in Trenčín. Charlotte Stiglitz (Sarlota, Sali) born Büchler er is concealed in the Hodžova No 1 and Razusová street No.4 Trenčín in the house of his family under the National Administration in the home of her daughter Julia (Juli) Ličko. At the end of October of 1944, was towed from this apartment the Hlinka Guard and deported to deported to a transit camp in Sered and from there to concentration camp Auschwitz of which have already been returned. (Windows double apartment on the ground floor of the daughter in the left, where he lives with three of their four children.) After the year 1945 in a trial in Trenčín persones opposite parties to deportacion slowakian citizens to the concentration camps judge at the Julia Ličko (Juli) born Stiglitz most vulgar way that his mother has not, it is unnecessarily critical and why the opposite denouncing them. For the study why they stand against brother of Julia Ličko (Juli) born Stiglitz this would not, from him as a dog wiggle tail. This was typicle stndart behavior such judges. When you see money and live where scent power bowed ears, above standard were to meet her and make your bed disguised aggression on innocent persons, from which there is nothing to them. Justice Minister JUDr. Štefan Rais. The author\'s father said "Aladár is a good man, but he is not fit for the current regime" (he recognized him from a joint study at the grammar school in Trenčín and ruled that the then First lieutenant Aladár II. Ondrejkovič renounced his profits for a 10 year service in the army in order to protect his marriage in the spring of 1944 and his family before deportation to the concentration camp). Early in 1944, the Ministry of National Defense and the Chiefs of Staff Army refused to issue a permit to marry under A-V-7 § 8, Article 5, leaving the service. These circumstances have prompted a considerable public offense in Trenčín for a long time. At that time Trenčín was a small town with the associated circumstances. The Trencians knew each other and knew about everything. 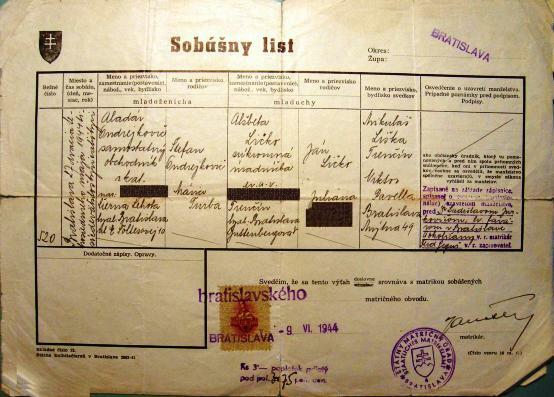 Evidence: The fourth report of the Czechoslovak State Higher Grammar School "Ľudovít Štúr" in Trenčín for the school year 1921-1922, Marriage certificate of Aladár Ondrejkovič and Alžbeta Ličková of May 27, 1944. People\'s law court persons of the former law court and prosecutorial target center of gravity of the judicial process so that things Meritum not discuss Case and therefore too affected persons, which was too longer discriminated against by the court and the real key players in case their rights damage. Violations of the rights of third parties in synergy courts, various offices and interested persons in the past was too widespread anti phenomenon and some publicly active persons in the long time benefit. Injured persons was officially sought and then subjected to long-term special attention to the courts, prosecutors and the STB (Secret State Security). Problem was the introduction of for exemple Institute called. People´s prosecutor. As restitution takes place in the city of Clochemerle. After a change of political regime in 1989, the author of the message cadaster Clochemerle refused to inspect the documents (grundbuch inserts) directly related to his family (despite the fact that restitution has taken place). Thus it was impossible to formulate precise restitution claims his mother and his family was financially damaged intentionally. For the purposes of restitution to be officially certified copies (grundbuch inserts) cadaster Clochemerle report it issued, so that left the main party. To report complaints cadaster Clochemerle responded to all of us known manner. (And meanwhile, took the time of restitution). Judgment No. 6C/42/2004 of the District Court Trenčín and confirmed of the Regional Court Trenčín dismissed the action of another eye on the issue of copies of lease contracts (shares co-owners and managers of the two properties it refused to submit to their signature) on the subject of real estate and management of the co-owners. Drafts, pensioner even had to pay court costs. Jozef Čevela, Valéria Čevelová born Stiglitz, Lady Alžbeta Ondrejkovičová born Ličková in the Trenčín, street of Generál M. R. Stefánik No 33. By 1938 Bohemia stud farm director originating Bohemia ing. Antonín Lokvenc father of the young lady Magda of good riders (colleague from the conservatory Ms. Magdalene Ondrejkovič-Sandor de Slavnicza) came into frequent contact with professional dragons young officer, who was Lt. cav. Aladár II. Ondrejkovič-Sandor de Slavnicza (multiple winner in military discipline and brother of Miss Magdalene Ondrejkovič) on the property of the family of former compossesorát grandmother Anna Sandor de Szlavnicza in Motešice in taking remounts. Later he met her at work during her career where you walked to earn extra income. Be welcome ? Second wife of the President of the CSSR Dr. Gustav Husák editor Viera Husáková Millerová Čáslavská and director of the publishing house "Pravda" Irena Blühová Weinerová. Vladimir, son of the editor, was a classmate of the author of ZDŠ Vazovova 4 in Bratislava. With another classmate, Marián Benkovič, they were members of the Slávia UK swimming club. Their trainer, and the native of Zlaté Moravce, the olympionik Vlado Skovajsa (in Zlaté Moravce, until October 1938, District Chief Dr. Aladár I. Ondrejkovič, then appointed as District Chief of Prešov, after successful completion of the mission appointed as District Chief in Bratislava). In 1919-1920 the Tekov-Nitra comes JUDr. Martin Mičura, family of Ondrejkovič. Subsequently, as Minister of the Administration of Slovakia, he also decided on Regional Officers and District Notaries. 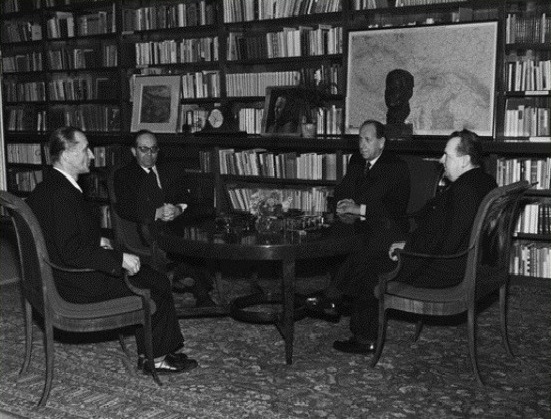 After 1945, the President of the Resignation Corps and Interior Commissioner Dr. Gustav Husák left in the positions of the chief councilor of the Ministry of the Interior of the Slovak Republic, Dr. Karol Reindl, also the chief councilors of the Interior Ministry of the Slovak Republic, Dr. Viktor Pavella. Dr. Aladár I. Ondrejkovič was appointed a police criminal judge in Bratislava. At the beginning of 1947, he appealed to the public administration and state administration in Trenčín in connection with the violation of the rights of Julia Ličko born Stiglitz and her children. There was an immediate transfer of Captain tank Aladár II. Ondrejkovič from the position of the Referee, Adjunct Commander of the Tank Army of the 4th Military District in Bratislava to the 2nd Automobile Battalion in Přelouč in Bohemia, dismissal from the position of his Commander Lt. Colonel tank Ján Malár, death in the car accident of the Chairman of the Commission of the Slovak National Council for the Recruitment of Military Guardians to the Czechoslovak Army, the Deputy Lt. Colonel Milan Polák. In addition, Stalinists Viliam Široký, Rudolf Strechaj (the Deputy of Justice, had relations between 1939 and 1945 with the former senior officials of the Trenčín County and JUDr. Ružena Martiny-Brtková) had been subjected to him since his appointment No 2T399/1953 against Čevelas was informed about the identity of Sarlota Stiglitz born Buchler in 1948 in proceedings No. M 155/47. He had knowledge and involvement in the brutal investigation and intimidation family of Alžbeta Ondrejkovičová born Ličko.Type officers of the STB in 1953 in connection with the masking of this falsification), Karol Bacílek, the Minister of National Security, was involved in the brutal investigation and intimidation of Elizabeth Ondrejkovičová born Ličko. 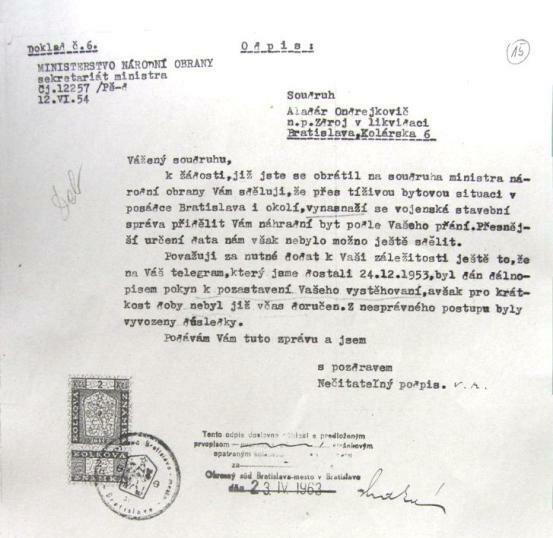 The officers of the STB in 1953 in connection with the process of No 2T 399/1953 against Mr and Mrs Čevela and co-sponsored the action "B" against the manager teacher Štefan II Ondrejkovič as a result of his death) and Jozef Lietavec (the Interior Commissioner ruled the brutal investigation and intimidation of Alžbeta Ondrejkovičová born Ličko by the State Secret Service officers in 1953 in connection with the trial proceedings number 2T 399/1953 against the Mr and Mrs Čevela and directed the action "B" against administrator teacher Stephen II Ondrejkovič as a result of death. From the Bojnice personally recognized the notary the family of his wife Mária Ondrejkovičová born Turba). The benefactors took the students and gave them lunch, dinner, providing an apartment, etc. They were pp . : J. Branecký, Rector of Piarist, Dr. E. Brežný, Fr. Bogyanský, R. Cicutto, G. Dohnányi, J. Diera, parish priest, A. Fuchs, captain Joz. Hamerle, G. Hass, Monastery of Notre-Dame, Cat. Unity of Women, Max Kaunitz, Ján Ličko, Fr. Maráky, Moravia café, J. Markovič, J. Országh, Dr. N. Pereszlény. E. Polák, J. Reihel, Rudolf Scháner, Dr. A. Strechay, C. Štúrová, Š. Spiller, Dr. P. Toffier Tatra hotel, E. Weinerová, dr. J. Zaťko ... Proof: Report on the activities of the Supportive Society at the State Real Gymnasium in Trenčín for school year 1924/1925 (until June 4, 1925). Jury at the county court in Trenčín. On October 18, 1926, they were drawn as the main ... 4. Ladislaus Mednyánszky of Mednye, landlord (bloodline family Ondrejkovič) ... 13. Ondrej Záhumenský, dealer, Vysoká ... Source: newspaper "Trenčan" of 2 October 1926 page 2. Jury at the Regional Court in Trenčín. The following jury will be drawn for the second jury session, which will be commenced on Monday, June 8, th, 9 am: A) Main: 8. Juchelková H., wife of Major, Trenčín, Hasičská 5, 14. Kollárik V. shoemaker master, Kysucké Nové Mesto 103, 22. Munk G., businessmann, Považská Bystrica, 35. Šumichrast E., Trenčín master, Trenčianska Teplá, B) Replacement: 2. Gáťa J. Jozef, Vajanský No 8 Trenčín, 6. Ondrejkovičová M., wife of the school administrator, Trenčín, Legionárska 7, Source: newspaper "Trenčan" of May 16, 1931 page no. 2 and 3. Newspaper "Južné Pohronie" Year II. number 1. 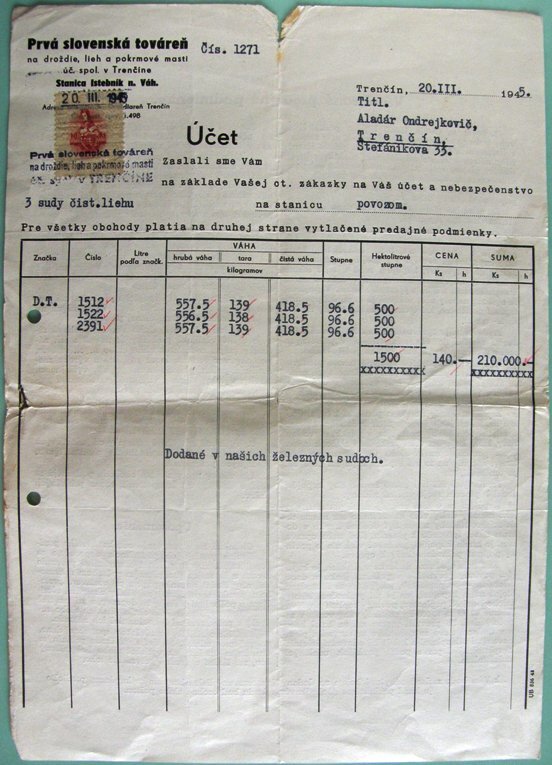 Emergency support for unemployed and dependent people from 17 December to 29 December 1932 downward marked additional payments in the amount of CZK 13,211 were made. Breuer Jonas 60.-, widow Belopotocký Arpádová 14 .- Dubovský Ján 100 .-, Eisler Leopold 100 .-, Jesenský Štefan 200 .-, Ondrejkovičová Mária 195 .-, Wilcsek Salamon 100 .-, ... The lovers of heart will not accept our sincere thanks. Emergency Commission. Source: newspaper "Južné Pohronie" of 1 January 1933 page 3. In 1958 Ms. Viera Miller (future wife of the President of the Czechoslovak Republic Gustav Husák) worked in the Slovak publishing house of political literature on the street Čs. army in Bratislava. 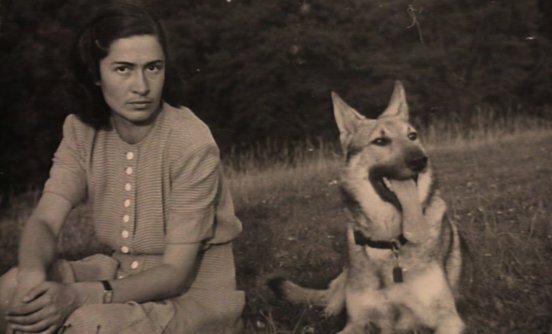 Her immediate superior until 1939 was Mrs. Irena Blüh - Weiner (the schoolmate of Julie Ličko born Stiglitz and Marta Hladká born Rais), who was responsible for helping her for racial persecution in 1939-1945 by friends (eg Dr. Viktor Pavella, colleague, native and friend, and Dr. Karol Reindl, sister Stephan II. Ondrejkovic\'s husband) and family members of First Lieutenant in reserve Aladár II. Ondrejkovič. Circular notary in Liptovský Ján, founding member of Matica Slovak 1083. (820) Július Pavella exhibited new documents in the years 1939-1945 to citizens in illegality for political and racial reasons. With respect to the anti-Jewish government regulations and the A-XIV National Defense Ministry\'s prescription, First lieutenant Aladár II. Ondrejkovič came out in March 1944 of service in the Slovak Army, appeared before the secret marriage. The married couple married the Evangelical parson Dr. Ladislav Jurkovič from the well-known Slovak family and the attendant registrar was Albert Okolicsányi of the most famous evangelical family in Slovakia, related of family Ondrejkovič. Witnesses at the wedding were the chief counselor IM Dr. Viktor Pavella and Mr. Mikuláš Liška. Dr. Viktor Pavella (colleague and native of Dr. Karol Reindl) was a brother-in-law of painter Imro Weiner-Král (a relative of Sarlota Stiglitz born Büchler, the bride\'s old mother) and brother-in-law of Irena Blüh. Dear Mr. Mikuláš Liška, was a 1/2 Herbária owner. After a mutual agreement, he took over part of Sarlota Stiglitz born Buchler. As an arizator in 1940, he passed from protectorate of Bohemia and Moravia to Slovakia mother of bride Julia Ličko born Stiglitz and her children. He saved them at least before deportation to the Terezín fortress. They were forced to register in Brno because the parents of the bride Ján Ličko and Julia Ličko born Stiglitz was divorced. At the divorce in 1937, the relatives Julia, mother of the bride, insisted. Most of the sales of "Herbária" Liška and comp., Trenčín, formed the production of spirits in a semi-cold and cold way. Without deliveries of alcohol to a regulated distillery from the distilleries, she could not produce and employ until October 1944 the former managers of "Herbária" Sarlota Stiglitz born Buchler and her son Pavol Stiglitz. In a company specializing in the production of bouquets, juices and essences, their other essential components, was Sarlota Stiglitz born Buchler and controlled their production. Dr. Gustav count Csáky the owner of the house in Hrahov, the family of Sandor de Szlavnicza (family since the last quarter of the 19th century too the family of Ondrejkovic) with whom his family had a family-owned family property. He was born on May 30, 1883 in Smižany. Vice-President of the Slovak Spirits Industry, Levoča-Malacky and president of Zipser historical comp. Due to its function, it has had a decisive influence on the height of state-controlled alloys of "Herbaria". He had long-standing social and professional activities with the founder of the Horná Nitra Museum Association. He was the chief court official of the District Court in Prievidza Gejza Turba, the brother of Mother of First lieutenant Aladár II. Ondrejkovič. Even nowadays, Herbária presents the misleading and misleading information of Trenčan for Trenčans about Trenčín from January 2011. As from the 1950s in Trenčín, despite the changes in the remuneration of social productive means after 1989, nothing has changed politically and civic-law since 1989. On 27 November 1932, Malvína Kováčová and Pavol Stiglitz, the only brother of the music composer Julie Ličková born Stiglitz and Valérie Čevela born Stiglitz, married in Trnava. Pavol Stiglitz was born in 1905, never having a brother. 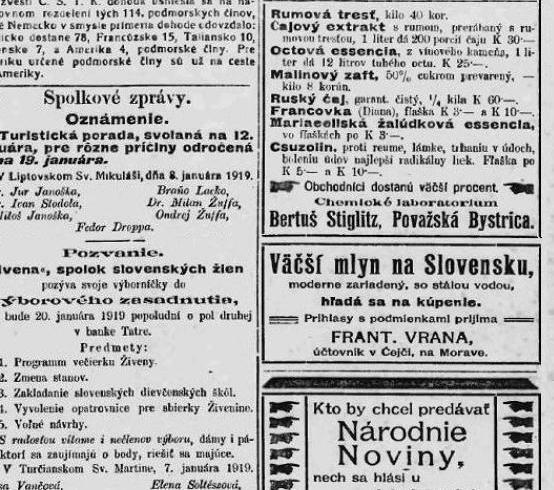 Bertuš (Bartolomej, Bernard) Stiglitz, newspaper ad in a national newspaper dated 10.01.1919 of the owner. Trieste sale produced and supplied by "Elza" Ltd. whose owners were Bartolomej Stiglitz and his wife Sarlota Stiglitz born Büchler. Raw materials for manufacture of Trencin supplied commodity company "Produktiva", whose owners were Bartolomej Stiglitz (after his death in 1936 took over his share of Sarlota Stiglitz born Büchler) and Ján II. Ličko. An advertisement offering its own products an ancient father of the author, brilliant entrepreneur Bertuš Stiglitz (Bartolomej, Bernad) in Považská Bystrica before moving his family to the city of Trenčín, seat of the county. His companies, apart from those based in Trencin, were based in Považska Bystrica, where he was District Chief of Dr. Aladár I. Ondrejkovič Freiherr Sandor de Szlavnicza. His family by mother Anna Sandor de Slavnica was the owner or, respectively, co-owners of large agricultural and forest assets in the Trenčín and Nitrian region, including the municipality of Slávnica. In the second half of the 19th century, his old father, was a Stephanus Freiherr Sandor de Szlavnicza. In the district of Puchov, the District Governor was Alexander Androvich, his double blood-related family member Ondrejkovič. The entrepreneur Bartolomej Stiglitz, after the declaration of the Czechoslovak Republic on October 28, 1918, used the official name of Bernad or Bertha but Bartolomej in all official documents. In the records of Matrika Trenčín, corrected by the District Office of Trenčín 06.10.1994, and repeated requests of the author are given the surname pronounced by the District Court of Trenčín number M 155/1947 for the death of Sarolta (in fact Sarlota) Stigliková (in fact Stiglitzová) born Büchlerová and the deceased the reality was the widow) Bernard Stiglik (in fact Bartolomej Stiglitz), who had been poor since 26.06.1936. 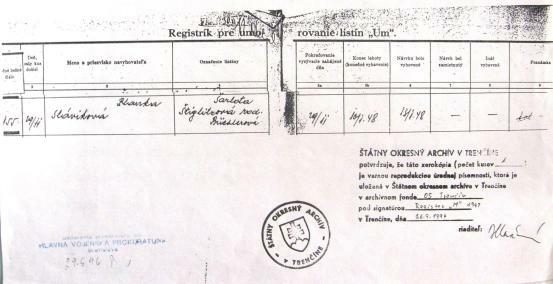 The direct evidence of the intentional illegal proceedings of Trenčín - Registry Office is also that the District Office in Trenčín did not include in the Death List nor the last residence of Sarlota Stiglitz born Büchler, which was known as Trenčín, Stefánikova 32. Misleading Resolution of the District Court of Trenčín act No. M155/47 - Declaration of the death of the author the grand old mother Šarlota Stiglitz, born Büchler. Resolution No. M155/1947 of the District Court in Trenčín issued on 13 January 1948 by judge Dr. Ružena Martiny-Brtková. Šarolta (in fact Šarlota) Štiglitzová born Büchlerová (she was in fact a widow since March 26, 1936). The first name and surname of her poor husband used in all official documents was Bartolomej Štiglitz. The residence declared to be dead was Trenčín, Štefánikova 32. At the end of October 1944, she was removed from the arizated apartment building of her family under the National Administration in Trenčín on Rázusova Street 4. Evidence that Dr. Attorney Dr. Alfred Barač held a misunderstanding that he also met personally and Catholic relatives of Sarlota Stiglitz born Buchler, for example, Tibor Ondrejkovič, who was the husband of the daughter of Julia Ličková born Stiglitz. Proof: The newspaper "Trenčan" dated June 12, 1937, page 4. As publicly active entrepreneurs in Trenčín, Bartolomej Stiglitz and Sarlota Stiglitz born Buchler, also met their lifetime at least since 1923. Proof: the Hiradó newspaper of 10 June 1923 page 8. Evidence that in case M155/47 District Court Trenčín, acting judge, Dr. Ružena Martiny-Brtková held a deliberate misleading list of pupils Czechoslovak state higher gymnasium "Ľudovít Štúr" in Trenčín from the school year 1921-22. In this section are placed pupils of class 1.a Ružena Martinová, born in Budapest (Trenčín), ... Ladislav Kellermann, Trenčín, ... Helena Gáťová, Trenčín ... and pupil 1.b class Oldrich Ondrejkovič born in Čierna Lehota Lednické Rovné). Educational staff of grammar school voluntarily changed the name of Aladár II. Ondrejkovič to Oldrich. His childless (or those who had only daughters) family members of high social status in the Trenčín and Nitra districts, who were designated as the future head of the family, objected to it. Probably at the gymnasium, the future lady judge has adopted arbitrary purposeful manipulation of the first names and surnames, the scandal certainly remembered, the uncle of Aladár II. Ondrejkovič was at that time His Excellency Minister with Power of Attorney for the Administration of Slovakia Dr. Martin Mičura and his other uncle were His Excellency, of Nitra Bishop ThDr. Karol Kmeťko. Perillustris Dominus Dr. Aladar I. Ondrejkovič was, in the incriminated period, the main servant in the Great Topolcans, graduated in 1908 at the grammar school in Trenčín. Proof: The fourth report of the Czechoslovak state higher grammar school of "Ľudovít Štúr" in Trenčín for the school year 1921-1922, pages 10 and 11. In this report, 11, 12 as a pupil II. Class Reis Stefan (editor of "Radio Moscow" 1939-1945 and Minister of Justice 1950-1953), Žliechov. (Trenčianske Teplice) and Jozef Tiso (Director of the Kavasnica factory in Trenčín), Trenčín, on page 13, pupil IV. Kočiš Oldřich (Aladár Kočiš, Editor-in-Chief, Minister and Secretary General of HSĽS), Trenčín, p.13 pupil VI. Brtko Ludevít, Lipt. Sv. Mikuláš, (Trenčín). According to party no. 4 Class Professor of Aladár II. Ondrejkovič was Vladimír Němec, X., Ch, P, taught Ch, in tr. IV, V, VI, P in L.a, I.b, V, VII, Cs. in I.b, 20 h, in II. Halfyer also Z in III, 22 h, classes in I.b, administrator sb. Chh, game surveillance. Dr. Ružena Martiny-Brtková was a student of the Czechoslovak state real grammar school in Trencin at the time when Colonel tank Aladár II Ondrejkovič was also studying there. She graduated in 1929. She graduated at the Faculty of Law of the UK in Bratislava on March 30, 1936 (Dr Martin Mičura was the examining commissioner for the Civil Law and Judicial Code Division of the State Examination Commission for Lawyers). 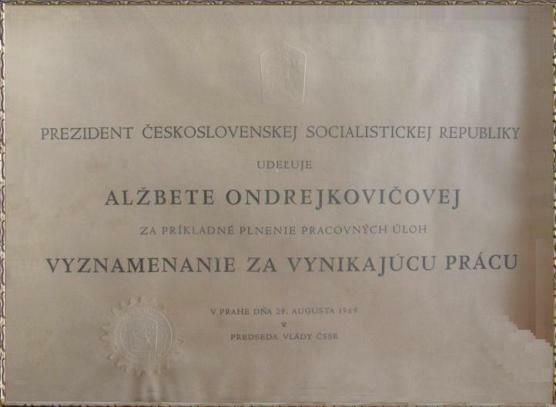 On June 27, 1936, she joined Dr. Jozef Monček in Trenčín. After less than a month, she was appointed as a legal assistant to the Regional Court in Trenčín. Source: Archive UK, fund: PraF UK general. The residents of the Central State Security in Bratislava Galvánek and Ščastný from Trenčín (his service apartment was in Bratislava on the seafront next to Devín Hotel) in 1940 harassed Maria Mária Turba, mother of First lieutenant Aladár II Ondrejkovič he took, which resulted in an extraordinary public shame for both of them. Journal "Národná obroda". Why did the District People\'s Court prosecute prosecution Dr. St. Galvánek ? Source: Newspaper "Národná obroda" dated 07.12.1946, page 2. Revision in Trenčín textil factory. Also, heavy distibuctance violations have been detected. Corporate Director J. L. the main culprit. The Supervisory Commission of the Industry and Trade Chief commented on these companies: ...... Václav Urbánek "Toxo..." Trenčín, Eugen Brtko, Trenčín ..... Source: newspaper "Národná obroda" dated 14 December 1946 page 3. Tennis courts at the villa Štefániková No 33 (9) of Trencin next army Stefaniks barracks in 1943. Pictured Irish setter author\'s father. After several years of former Slovak officers already as tall retirement Cs. officers remind the author that here in tennis (if invited) observed with admiration his mother and his father with envy their colleagues. One indiscreet Colonel, former unsuccessful suitor is only with regard to the age asked the question whether envied his father even though he MD emigrated with his family from an apartment on the street, doing worker, the evenings were sold on the street as a newsman newspaper Evening News. Even after years understood that the author\'s mother\'s partner relationships her family to decide which were the most important social interactions with her partner\'s family and for her willingness to help racial and political persecution. Soviet advisers participated in the consolidation of the power position of the Communist Party in the army, and the implantation of the Soviet military doctrine was controlled. After the withdrawal of Defense Minister General Ludvík Svoboda and the exchange of command in April 1950, they came in several groups and worked in the structures of the army from the Ministry of National Defense to divisions. The headquarters of the 2nd Military District in Trenčín were assigned to Soviet military advisers Major General Mikhail Matveevič Danilov (since July 1950 he was on a business trip as a military adviser for Commander of the Military District of the Czechoslovak Army), Colonel N. I. Jevseyev and Colonel N. A: Metelov. The headquarters of the 9th Division in Trnava was Colonel I. M. Proničev. Between motor vehicles confiscated the judgment of the former People\'s Court in Trencin No 2T 399/53 on Štefániková 33 (9) in Trenčín was a Skoda 420 Rapid. 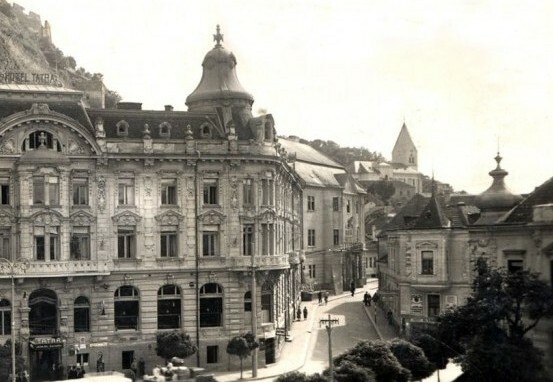 The Tatra Hotel, which was exhibited in 1953 during the investigation of the entire public in Trenčín between their state confiscated by Mr. Jozef Čevela and Mrs. Valéria Čevelová born Stiglitz. Next to the hotel in the aisle at the back is the County Palace, the seat of Vice-Comes Gaspar Sandor de Szlavnicza and also the Trenchian County Judge Stephanus Sandor de Szlavnicza, a family whose grandson Lt. Colonel tank Aladár Ondrejkovič was the husband of their neuter Alžbeta Ondrejkovičová born Ličková. During high pregnancy, Alžbeta was aggressively investigated, extorted and insulted in the office of Czechoslovak State Security in Bratislava in 1953 in connection with case M/155/1947 of the District Court Trenčín and the proceedings of the former People\'s Court in Trenčín proceedings number 2T 399/1953 against spouses Čevela. She had to be hospitalized at the former Jewish hospital on Šulekova Street in Bratislava because of her life and life threatening her life. At least the life of his still unborn baby was saved by the primary gynecological-clinic clinic at Šuleková MUDr. Ladislav Wunder, cousin of Maria Ondrejkovičová born Turba, mother of her husband. But he did not let him know what he thought of his high-rise family in Prague..
Whoom something recalls it today ? The Judges and so-called. People\'s Prosecutor\'s Office with Command of the 2nd Military District in Trenčín in Criminal Procedure and in the Judgment of the former People\'s Court Trenčín no. 2 T 399/53 in 1953 against his husband Jozef and Valéria Čevela born Stiglitz manipulated the whole of the case. Judicial Persons of former People\'s Court and prosecutorial target centroid of the judicial process so that things not hears MERITUM Case and therefore also affect persons who were more discriminated against by the court (for exemple Julia Ličko (Juli) born Stiglitz and her children) a real key players in case their rights damage. Cousin of Julia Ličko born Stiglitz, Valéria Čevela born Stiglitz and Pavol S. (hid in a psychiatric Hospital). On the other side the Minister of Justice JUDr. Štefan Rais, on his left, Prime Minister Antonín Zápotocký and President Klement Gottwald (in connection with the trial of the former People\'s Court in Trenčín No. 2 T 399/53 at the meeting of the Government, the chairman Antonín Zápotocký addressed JUDr. Štefan Rais: Pišto what does your family do in Trenčín ?). 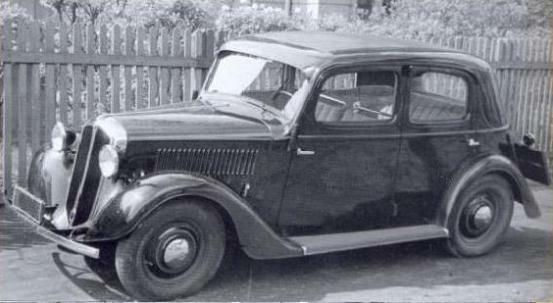 In addition to high tax-free monetary income in Czechoslovak crowns, Soviet military advisers were also entitled to preferential purchases of food and textile goods and to the allocation of a service motor vehicle that they could also use for private purposes. Furthermore, they were reimbursed for their travel expenses, including for the holidays to the USSR, received family allowances, had free medical treatment, spa treatment, and recreation. The total annual cost per advisor in 1952 was around a million crowns. Source: Military History of Slovakia VI. 1945-1968 Jan Štaigl and Michal Štefanský page 135. Author\'s Note: 1 million Kčs in 1952 represents at least 1 million Euro at today\'s prices. 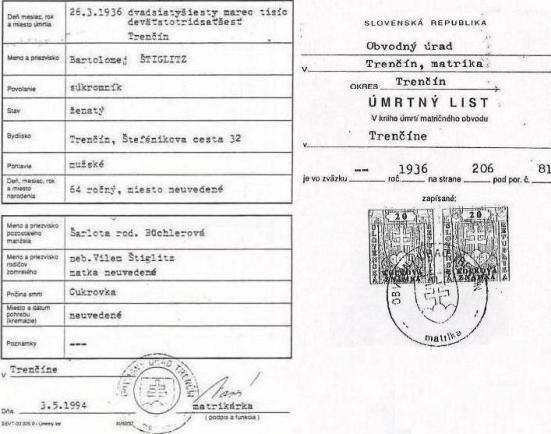 In Registrar Um 155 of January 13, 1948 the surname and baptismal name of the great old mother Šarlota (Charlotte) Štiglitzová native Büchlerová was stated correctly, the test for unlawful change of her surname took place at the District office of Trenčín - Matrika and if she did not change the name of her bride and in fact, at the District Court Trenčín. The complaint of the author took over 29.06.1996 The General Military Prosecution Office in Bratislava, as it is directly related to the criminal proceedings number 2T 399/1953 of the former People\'s Court in Trenčín and in proceedings of District Court Trenčín proceedings number 10C 1125/1996 against the defendant of the Ministry of Defense of the Slovak Republic. Gejza Galvánek, stores shop inspector of Ovocie-Zelenina National enterprise was, according to his claim in 1972, the author, the friend of the family Ľudovít Brtko and the judge Dr. Ružena Martiny-Brtková, whom he has known since 1939. From an interview with colleague Olga G. and Chief Milan N. in 1973 in the ČSPD National enterprise on a topic to which the author did not at all appear to have both been informed that the last Austrian Hungarian Trenčín county comes from July 1917 László Mednyánszky de Mednye and Medgyes, the blood-cousin of the author\'s old father, Stephan II. through his mother Anna Ondrejkovič born Sandor de Szlavnicza and her father, the Trenčín County Judge, Stephan Sandor de Szlavnicza. Father from Stephan II. District Notary Stefan I. Ondrejkovič was already a financial contributor to Matica Slovenská as a student. Proof: Year of the Slovak Matica Year VI. Book I, issued in Banská Bystrica in 1869. The author, until 1989, spied and denounced in front of the cadre union of his mother Alžbeta Ondrejkovič born Ličko and her family in the ČSPD national enterprise of his superiors and colleagues (O.G, M.N., M.B, I.P, P.J, P.B) and in his personal life other persons had various connections to Trenčín (for example, JUDr. Martiny-Brtková and JUDr. 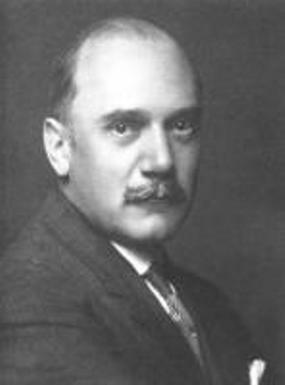 Silvester Slezák). As a result, refusal of aura to study and its refusal was refused even if the admission examinations at the PF UK were successful. Some officials are even today do not hesitate repeated invective against the author of the forthcoming family. For exemple officials in the state archives to Drotárska street in Bratislava. Certainly it had its tangible reason. At present it is proved that following the political changes in 1989 during the prohibition and restitution procedure under Act No. 87/91 Collection of Laws on Out-of-court Rehabilitation, dwellings in the house at Hodžova Street 11 were disposed of (City of Trenčín and City Housing Company Trenčín) in Trenčín (to whom she had a statutory right under Act No. 87/91 Collection of Laws the mother of the author). In addition, its shares of the ownership of the apartment building in Hodžová no. 11 and other properties in Trenčín belong to third parties. The people in question, including the various authorities and public authorities in Trencin, do so when they know that their poor husband Lieutenant Colonel tank Aladar II. Ondrejkovic Sandor and the author are direct descendants of today, especially for Slovakia, the most outstanding Trenčín family, Ondrejkovics - Sandor de Szlavnicza. The fourth report of the Czechoslovak State Higher Grammar School "Ľudovít Štúr" in Trenčín for the school year 1921-1922, pages 10 and 11. The report contains on page 11, 12 pupils of class II the next Minister of Justice JUDr. Reis Štefan, Zliechov (Trenčianske Teplice) future Director of the Yeast Plant Tiso Jozef, Trenčín, p. 13 pupil IV. classes Kočiš Oldřich (future editor-in-chief and minister of education 1944-1945 Aladár Kočiš), Trenčín. Ružena Martinová (future judge Dr Ružena Martiny-Brtková) has issued a knowingly mistaken decision of the District Court of Trenčín "Declaration of the Death" of M 155/1947 of 13.01.1948 damaging and disparaging families Stiglitz, Buchler, Ličko, Ondrejkovič, Lederer, Kellermann), born in Budapest (Trenčín), Ladislav Kellermann, Trenčín and 1.b class Oldrich Ondrejkovič (in fact Aladár II. Ondrejkovič) born in Čierna Lehota (Lednické Rovné). Gymnasium staff changed the name of Aladár II. Ondrejkovic to Oldrich. His family (or those who only had their daughters) were family members with high status in Slovakia and in the Trenčín and Nitra districts (Minister JUDr. Martin Mičura, District Chief Dr. Aladár I. Ondrejkovič), who was designated as the future head of the family against it . According to party no. 4th grade professor of the future Colonel Aladár II. Ondrejkovič was Vladimír Němec, X., Ch, P, taught Ch, in tr. IV, V, VI, P in L.a, I.b, V, VII, Cs. in I.b, 20 h, in II. half a year also in Z at III, 22 h, classes in I.b, administrator sb. Chh, game surveillance. is litigation No 10C 1105/1991 since 1991 very sporadically by the District Court of Clochemerle. As one of the restitution disputes under Act no. 87/1991 Coll. was initially uninteresting when we neglected the fact that several of the applicants had insufficiently substantiated and formulated requests to the Complainant, at that time also to the Ministry national defense of the ČSFR in representation. At this stage, problems arose. The Clochemerle Cadastre Administration has refused to issue papers under the pretense of issuing documents (even today it announces that the employee who has their leave at home or is locked somewhere) is required to apply for the issue of property. (Mrs. PhDr., One of the promising restitutionists threatened them: "Do not take care of the papers, I know Clochemerle in the Clochemerle Report, which prevents you from getting to them". Two of the eligible persons were therefore forced to pressure to agree to be represented by a lawyer chosen by those whom they did not trust. These persons have done the necessary acts by which they have been charged by the lawyer as well. Despite the fact that these two persons had no access to documents as laypersons formulated their applications under Restitution Act no. 87/91 Coll. to the persons liable to be issued legally without error on the basis of documents from the archives in the capital. There has already been a great conflict between hopeful restituents. One eligible person publicly criticized a potential retired person with the widest lashes (PhDr. - the nomenclature of the Communist Party Communist Party, the former director of the institute dismissed by the staff and the forensic expert, threatened with the co-defendants that when they did not sell the property for the price determined for them, with the help of its well-known judges at the District Court, Clochemerle), the fact that their joint attorney was not filed for the issue of property for all eligible persons and some land was omitted. The situation was scandalous. Allegedly high-educated people cried out on the street, blamed each other for fraud, and demanded assistance from those who had left the retreat by manipulation. There was no other solution for them to ask them to join their request for extradition. It was necessary to cancel the original contract for the issue of real estate with the obliged person Lovakotex n.e. and at the request of an outsider to conclude a new one, which also contained the valuable parcels concerned. The affair team did not end. Obligatory person The Ministry of Defense has already refused to issue property at this stage, inter alia because only two eligible persons out of five within the statutory time have requested the issue of all property. One of them has limited its application. The joint advocate of potential restitution seekers, seeking to rectify their mistakes, asked one of them in retirement age (her son treated her application for the Issuance to a Compulsory Person, was abroad overseas) of her request. Its consent to use for the other resi- dents was not given to the court or to the Complainant. The Clochemerle District Court has already ruled that in one of the first lectures, it has ruled on the issue of real estate without the presence of the lawyer\'s representative, and he has not dealt with his arguments. The Respondent appealed, inter alia, arguing that not all eligible persons had claimed a restitution claim within the statutory time, and not all of the assets in question belonged to the jointly-owned property. The District Court in the capital has given the right of the defendant and the Clochemerle District Court judgment was annulled by order of 29 January 1993 and the case returned to the next hearing. It also prescribed how the District Court Clochemerle must deal with the case (coaction distribution). He also pointed to the lack of professional expertise of the Clochemerle District Court. The two promising 50% of the unit responded to this by abrogating the power of attorney to the attorney and asked the court for his name to issue all the assets. They did not know how the co-Ukrainism was divided according to the Hungarian Laws (the Czech nationality), according to which the Resolution of 1993 ordered the Supreme Regional Court in the capital to deal with the case. These out-of-school educated people have also naively forgotten that their request for extradition has been additionally used after the statutory deadline by their co-official and her son\'s lawyer in law. None of the judges of the District Court, Clochemerle, had been advised on the professional and personality side of the case with regard to lobistic pressures. To reach one person from the plaintiffs, he bought the shares of the restituted property from other persons. Subsequently, in 1993, she filed a lawsuit against the District Court of Clochemerle for a person, which allowed her to join her request for extradition so that she could also apply restitution to multiple plots. The amount it intended to pay off did not differ from the official estimate of the former regime. Her price negotiation was such that, for example, the son of a real estate shareholder in Clochemerle announced that when their mother did not sell their property shares, she would order them to be dismissed from work. The District Court of Clochemerle in the case dealt with the defendant even though he did not have his Property list papers and had no Property list share of other co-owners. Although the defendant had an authorized lawyer, that court ordered the police to investigate her stay in the hospital despite receiving a document from the attending physician before the hearing. Despite the objections, the defendant court later issued an irrevocable Resolutions based on an Property list with the defendant\'s false identity and altered material content. The court, the lawyers, and the Cadastre Administration sent where they fit the documents with their false identity and where they fit it with its proper identity. In addition to the application for interim measures, the Complaint was filed with a complaint lodged by the competent Court President and the Ministry of Justice. To this situation, the representative of the defendant responded by changing the petition and by withdrawing part of his Proposal against the Defender in favor of the other petitioners at the District Court of Clochemerle. Since then, it has been discussed about twice. In this situation, the attorney at the Ministry of Defense announced at the hearing that he was willing to issue real estate. At the last hearing, the judge announced the petitioners to agree with each other. After 1993, the pp. loss of the former DPC ruling Clochemerle No. ...... of 1953 and other documents from the court file of the District Court. The appellant\'s representative submitted them to the Court. As soon as he found it, at the hearing, he challenged it and filed a complaint with the chairman of DC Clochemerle and with the chairman of LC Clochemerle. The Respondent stated at the hearing that he had probably failed to send his copies to the District Court ... and that he would produce the court\'s turnover. When reviewing the file, the representative of the petitioner found that from the judgment, which the Respondent additionally submitted to the 10 pages lacking the list of confiscated spirits, raw materials for their production, equipment for their production. It was not the copy that he had submitted to the Defender against the signature. This unlawfully modified copy of the former DPC\'s ruling was also found in the writings of the Resident when their author inspected them in the capital. Judicial District Court Clochemerle proceedings 1991-2017. JUDr. Jozef Břešťanský. From 9 to 27 April 1968, four officers of the Czechoslovak State Security Brigadier Lieutenant Colonel Bedřich Pokorný were killed by an undercut throat (among others the organizer of the Action "D" Officers running until 1953), MUDr. Josef Sommer shattered head, Lieutenant Colonel Jiří Počepický was found dressed in the woods and JUDr. Josef Břešťanský, who dealt with rehabilitation at the Supreme Court, was arrested on April 2, 1968 by the security authorities at Babice. JUDr. 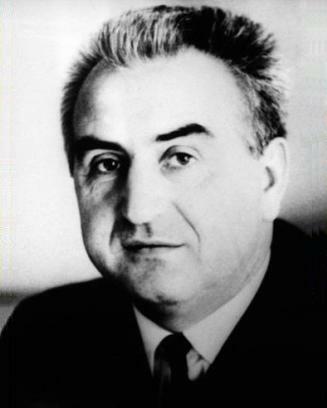 Jozef Břešťanský participated in the elaborated processes in the 1950s, and in 1968 he was rehabilitating from the position of Deputy Chairman of the Supreme Court of the Czechoslovak Socialist Republic. Kopřiva Ladislav (* 28. 6. 1897 Ivanovice to Hané) - Czech Communist politic, the Minister of National Security was a member of CPC since 1921. The first Republic was cooperative official in the Communist movement. The Nazi occupation was imprisoned in the Dachau concentration camp. After 1945 he became a member of the CPC Central and until 1948 was chairman of the Provincial National Committee in the Czechoslovak Republic. 1948 he was head of the authority vested in the Secretary of CPC functions for vetting issues. In particular, lessons learned here to qualify to be built in May 1950 to head the Ministry of National Security established. You are fully subordinating Soviet advisers and specific activity shown as a member of "The Commission K", which had in the organization of terror and monstrprocesů for passing sentences of death. Together with the ominous Kopřiva Commission worked Chief of National Security Osvald Zavodsky, Minister of Justice JUDr. Stefan R., Deputy Minister for Justice col. Dr. Karel Klos, and Deputy Minister of National Security Karel Śváb. 1952 Kopřiva was replaced in his post Karel Bacílek. In April 1963, at the time of rehabilitation processes convicted communists, Kopřiva was excluded from the CPC. In 1971 the author accidentally acquainted his associate with Dr. V. N. This Dr., the senior worker .... later repeatedly suggested to the author to change his profession, which is, in his opinion, very demanding and demanding. He finds him a comfortable place where there are big side incomes. It did not seem to the author, and in his point of view it was not at all considered. When he told his mother, she was very angry. Until 2000, the author learned that Dr. V. N. had very close contacts with the incriminated persons and their families from Clochemerle. Following the death of the defendant in 2008 in Bratislava, a motion for an interim measure was filed by the DC Bratislava ..., the competent inheritance court. District Court Clochemerle in proceedings no. 10C ... 1996 filed in the matter with the competent inheritance court in Bratislava untrue information regarding the material substance of the estate which was pp. is in the Bronze Age subject of his actions and threatened by the inheritance court assigned to the heirs of the commissioner by fines. The proposal for an interim measure submitted by DC Bratislava ... was thus mutilated and allowed to transfer heritage objects to third parties. The administration of the Cadastral Bond sent to the inheritance in question, handed over to DC Bratislava ... falsified or, respectively, changed Property list k.ú. Blessed is not good. Upon receipt of repeated requests by the heirs for their correction, the Land Administration of Clochemerle threatened to one of the heirs that if he did not agree with the changed Property list k.ú. His bell toe. mothers, agree with the division of ownership of flats, sale of parcels of his or hers. mothers and p.p. sale of all his property without payment of the lease, makes him unable to inherit in the heirloom proceedings no.......... Subsequently, she resubmitted to the inheritance led by DC Bratislava ... unlawfully changed Property list k.ú. Blessed is not good. Dangerous threats are defined by the Criminal Code in such a way that the perpetrator is threatened with other deaths, serious injuries or otherwise in such a way that it can give rise to reasonable concern about such conduct. There is no doubt that the Statutory Representative of the Land Administration Clochemerle ...... has committed the threat in question. He had to know that in such a text he was capable of threatening damaged heirs. This was not a threat to a normal redemption proposal, but in connection with the fallen Property list in the inheritance after a poor damaged and at the Administration of the Land Registry Clochemerle about their repair. It is a property of considerable value. The gravity was all the more so that the redemption proposal, together with the heir to the heir was executed by a statutory representative, i. authorities in the context of the application of their constitutional rights by heirs. In this case, the complaints of the HCGC and the competent authorities were immediately filed with the attached evidence. They were rejected without further explanation, or were argued on merit. (1) Anyone who threatens to death by another, or to take a heavy health or other severe hardship in such a way that it may cause serious concern, shall be punished by imprisonment for up to one year. (i) a witness, an expert, an interpreter or a translator. (2) The provisions of paragraph 1 shall not apply where the offense has not been committed in relation to the status, state or age of the protected person. shall be punished by imprisonment for one to six years. (e) as a person exercising the jurisdiction of a court administration and administration. Court proceedings of the District Court Trenčín 1991-2017. In 2012, the heirs submitted a proposal for administrative proceedings to the Regional Court in Trenčín, the proceedings number 13S / 24/2013, because the District Office of Trenčín, the Cadastral Department again refused to correct the forged or respectively amended Letters of Ownership of the cadastral territory of the Trenčín Deputy. Illegal manipulation of surnames of the author\'s family or, their counterfeiting and their timely correlative changes and their surnames by actors in order to diminish their accidental identification (by third parties not involved in the matter). They are not, in any case, or gavaliership, as attempted to interpret by state authorities and public authorities in ....... and, for example, OGKK SK answers (from merit) the oldest known legal trick to more than 70 imputations. Thus, despite the fact that the authorities of the state authority and the administration in Trenčín and in Bratislava are aware that the entire breed notary family of the author participated actively in the Slovak national performances in the years 1848-1918 and directly participated in organizational directing of the functions of the Czechoslovak of the republic in 1918. They are aware that the family of the author and his relatives from 1918 until 1948 held high positions in state administration, local government, provincial authorities, district offices after a case in the army, and so on. From 1948 to 1953, it was only exceptionally. Even this is a kind of reward from the state authorities and entrusted to the public administration in Trenčín and Bratislava for the organizational work and civic attitudes of the breed notary family of the author in the years 1848-1918-1938-1948-1968 and round anniversaries especially for the 100th anniversary of the birth The Czechoslovak Republic and the Revolutionary Year of 1848. I wish you a quiet night service. Take a look at the oldest trench company for alcohol production and sales. Herbaria comes from Považská Bystrica, was a part of Trenčín\'s liqueurs. the paperweight corresponds to the date I specified ie the end of the 19th century. the beginning of the 20th century, I just did not know if it was a painting or a print. Old Herold, s.r.o. located in the premises where Kornhauser and Herzka, a factory for the production of yeast, edible fats and spirits, which moved to Trenčín since 1886, moved in 1932. One of the most important Slovaks of the 19th and 20th centuries, from 1919 to 1922 the General Supervisor of the Evangelical Church, deputy of the NZ, since 1920 Chairman of the Slovak Committee of the Central Union of Czechoslovak Industries JUDr. Milan Ivánka de Draskócz et Jordánfold had close relatives of senior officials in Trencin (County Judge Stephan Sandor de Szlavnicza, comes Ladislav Mednyánszky, District Chief Dr. Stefan Schurmann) and Nitra County (apart from the other villages), District Chief Dr. Aladár Ondrejkovič, Government Commissioner and Chief Servant Dr. Viktor Ravasz. After 1939 he actively participated in the resistance and until 1945 he was imprisoned in Terezín. TASR, 1 October 2015. Notes: Stephanus Ivánka de Draskócz et Jordánfold and his wife Anna Zsittnyan, Bánovce nad Bebravou year 1845. Mother of the District Notary in Dolné Držkovce and Šimonovany Stefan I. Ondrejkovič born in Bánovce nad Bebravou, the Catholic faith was Antonia Zsittnyan. The mother of his father in law, Trencin County Judge Stephan Sandor de Szlavnicza, Evangelical Faith was Eszter Ivánka de Draskócz et Jordánfold. In 1937, the District notary was in the village Melčice Ferdinand Taus. He asked for a transfer to the Parkan. He was satisfied only when he renounced his religion. 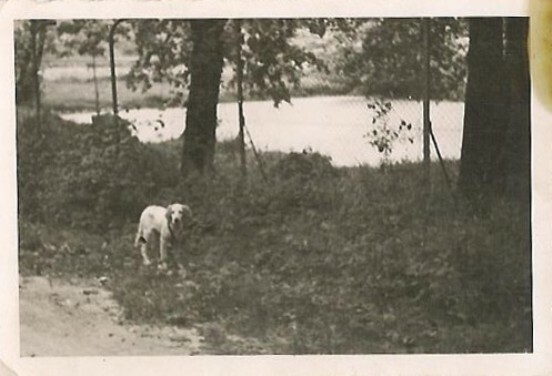 Source: Commemorative book of Kochanovce village 1937-1949. Dr. Arvéd Grébert joined the site of a cultural attache in Rome. The then Slovak envoy, Dr. Bohdan Galvánek, accused him of anti-fascist and anti-German attitude. In the summer of 1940, therefore, the German liaison officer in Bratislava asked Dr. Endroess his exclusion from the services of the Ministry of Foreign Affairs. Source: TASR, 2 October 2015. Veliteľ 2. vojenského okruhu v Trenčíne v rokoch 1952-1955 bol genpor. Jaroslav Ťokan. Od roku 1950 boli sovietski vojenskí poradcovia veliteľstva 2. vojenského okruhu generálmajor Michail Matvejevič Danilov (from July 1950 he was on a business trip as a military adviser for Commander of the Military District of the Czechoslovak Army), plukovník N. I. Jevsejev, N. A. Metelov a na veliteľstvo 9. divízie v Trnave dosadený plukovník I. M. Proničev. V roku 1953 bol na podnet veliteľstva 2. vojenského okruhu a MNO iniciovaný trestný proces býv. Ľudového súdu v Trenčíne sp. zn. 2 T 399/1953, nakoľko pre sovietskych vojenských poradcov vyhliadli vilu na Štefánikovej 33 v Trenčíne. In 1964, Pavel Ličko, an editor and translator from a well-known evangelical family, received a strangely punishable "punishment with warning" for the dissemination of the request for rehabilitation of Gustav Husák, which he had reprinted on the machine and let him reproduce. 4th Annual Report of the Czechoslovak state real Higher Grammar School of "Ľudovít Štúr" in Trenčín for the school year 1921-1922, pages 10 and 11. In this report, 11, 12 are mentioned as pupils II. class of Reis Stephen (future minister 1950-1953), Zliechov. (Trenčianske Teplice) and Tiso Jozef (future manager of Trenčín\'s Quaslin factory), Trenčín, on page 13 pupil IV. Classes Kočiš Oldřich (in fact Aladár Kočiš, future editor-in-chief, minister and generálny tajomník HSĽS), Trenčín, 1.a Káčer Pavol, Zay-Uhrovec, 1.b Politzer Otto, Brušperk (Trenčín). On page 11 there is also a pupil of class 1.b Oldrich Ondrejkovič born in Čierna Lehota (Lednické Rovné). Gymnasium staff changed the name Aladár II. Ondrejkovič to Oldrich. His childless (or those who only had daughters) family members with high status in the Trenčín and Nitra districts, who were identified as the future head of the family, objected to it. 5th annual report The Czechoslovak State. Real. gym. of " Ľudovít Štúr " in Trenčín. School year 1922-23. Mention of pupils: 1.c) class. ... Koloman Prónay, Malá Slatina (Továrníky). ... Renáta Tausová, Bošáca, (Trenčín). 7th Annual Report of the Czechoslovak State real Higher Grammar School of "Ľudovít Štúr" in Trenčín for the school year 1924-1925, page 12, II.A class 57. * Eva Baxová, Vienna (Trenčianske Teplice). 9th Annual Report of the Czechoslovak state real grammar school of "Ľudovít Štúr" in Trenčín. 1926-1927. b) The status of the professor\'s college at the end of the school year 1926/1927: ...... 5. Bohdan Galvánek, a supportive professor, taught from 1/19/31/19. Csl * Iae, VaB, IVbs, Fr HIb4, together 20 h, from I / XI. Fr VIb, together 23 hours, class at la. Class II.B 38. Pavel Žitnan (relatives Ondrejkovič), Bánovce. 40. Margita Nozdrovická (family of Sandor de Szlavnicza and Ondrejkovič), Turzovka (Trenčín). III.A. 35. Milan Jakuboci (a family of Ličko), Trenčín. II.B. 30. Ivan Širchich (family of Sandor de Szlavnicza, also Ondrejkovič), Trenčín. 45. Maria Nozdrovická (family of Sandor of Szlavnicza and Ondrejkovič), Turzovka (Trenčín). VII. 22. Štefan Reis, future husband of Eva Baxová), Zliechov-Gápel (Tr. Teplice). 27. Jozef Tiso (future husband of Renáta Tausová), Trenčín.